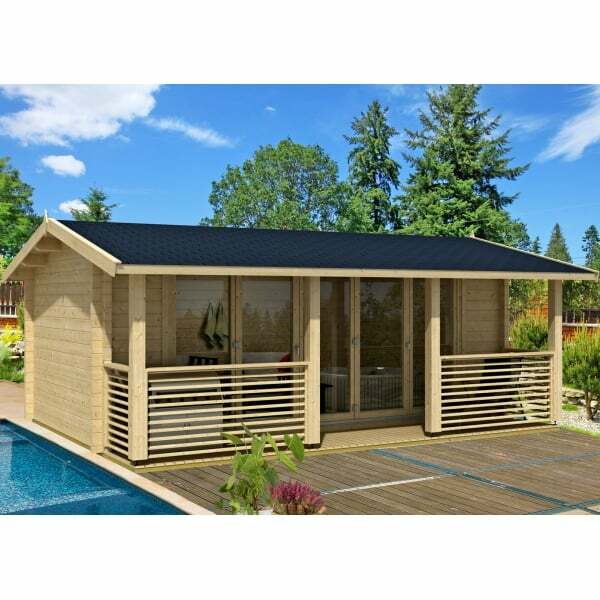 Norland Appleton Log Cabin: The Norland Appleton log cabin is a beautiful garden house that is 4m x 5.5m giving generous space inside with an undercover veranda area outside. This log cabin has a stylish and contemporary bi-folding door along the front which can be open right up to allow air to flow freely through the building. This building comes at one large space which can be utilised for a multitude of different purposes. This building would make a stunning garden office or recreational space away from the main house. The log cabin has 70mm thick wall logs and the glass on the door is double glazed, both of which provide this cabin with ample insulation that can be further enhanced by selecting the optional roof insulation. With only a small heat source your new garden building will be suitable for all year round enjoyment no matter what the weather. The terrace area on this log cabin is large enough to put out a small chair set so that you can sit and enjoy the fresh air of the outdoors even if the weather is against you. The ridge height on the building is under 2.5m in height so will make the perfect garden retreat without being too much of an imposing structure.